If you are serious about your business – no matter what kind of business it is or even if your business is a blog – you have business cards printed because they are a fast, effective, inexpensive way to remind someone you met them. If they have your card there is at least a possibility that they will remember you when they need you – OR even better – they will use your business card to get more information about what you do – IF you have a Web presence! I am certain that small businesses are lagging behind and fail to realize WHY it is so very important that they create an online presence immediately. GPS systems in their cars to find businesses. Many people are more willing to read your site than ask you questions directly. What you have online is EASY for others to share. Checking your site is faster than trying to get you on the phone – saving both you and them valuable time. Even though this should be OBVIOUS even most social media savvy bloggers I collaborate with and even I are guilty of not sharing enough. Perhaps it is our conditioning against self-promotion that is holding us back. hire us or send us clients or buyers? Even if you have NO IDEA how to make this happen I encourage you to read on because I am about to tell you the best way to do this. For years now the advice has been you MUST own your own Web site. I no longer agree with that because of the emphasis on continually updated content, user interaction and social media sharing (what PostRank calls engagement). Most business sites are static and do not regularly update content or answer comments and unless they hire an SEO are unlikely to appear in the search results. if no one ever sees it. While most will still be recommending you get your own Web site, I am going to make a very different recommendation. Buy your own domain name and have it pointed at content you have published on a very active blog. The main purpose of your domain name is to be easy to remember and share and – if carefully selected – be found online. you put in marketing your business or site is protected. Should the blog go away, become less active, or your relationship with that particular blogger not work out, you can simply have the information published anywhere else and point your domain name to the new location. Be publishing content about the geographic area where your physical business is located. Contain extensive content related to your business. Have a strong social media presence through a power account for the entire site. Be building niche social networking accounts for your geographic area and/or your specific area of interest so that they can reach your target audience. You don’t have to learn how to install a blog or design a Web site. You do not have to have the technical skill or hire someone to maintain your blog which requires regular WordPress and plugin updates. Your content will reach an immediate targeted audience a new Web site does not have. You can still have as many pages and as much content as you wish and add to or change it at any time. Because your content is on a blog you can grow your business using CommentLuv by simply commenting in related blogs. Build incoming links to bring targeted search engine traffic to your site (or hire the blogger or someone else to do this for you). You can use a link to your new domain name in your Local Search Directory Listings to provide even more information at the point of purchasing interest (when someone searched for what you have to offer). 100s to 1000s of small sites too! Put your domain address (www.yoursite.com) on your business cards and anything else you print. Use it as your landing page in Local Search Directory Listings to provide additional information you can edit, add to or change at any time. Add a link to it in your social media accounts on Twitter, Facebook, LinkedIn, StumbleUpon, etc. If you are active in online communities or forums you can usually link to your information. By having your own domain that links to more information, anyone you know online anywhere can instantly find out more about what you do and sell. Add it to any traditional advertising you do to turn even a tiny classified into your own personal online salesperson. You KNOW you need to do this, right? Even if you have NO IDEA how to make it happen I encourage you to see the additional information on my Hire GrowMap page or contact me. It is important that you make your website/webpressence smartphone and tablet friendly. If you put your phone number in the footer, you give the visitor on the phone an extra option to order from you by just clicking on your phone number in the footer. With the wide usage of the internet it is really an effective way to promote the business and to reach out to costumer. I think the cost is not a problem because it assures a lot of opportunities. Surprised that it’s only 56% of businesses without a website – I thought it would be larger. In general, I think that if businesses send out brochures, then it is definitely worth having a website, as that can save on printing costs and the text can be constantly updated. Some people are getting lured into the false sense of security of let’s just create a Facebook fan page and drive our traffic to it (yes, I’ve seen website domains just forward to a Facebook page, LinkedIn, etc.). What you don’t realize is that Facebook, LinkedIn, etc. has the rights at any time to change their network in a way that may mean less opportunity to use your page on their sites the way you need to for your business. At least when you have your own website and blog presence, you will have full control of your content, be able to access the information of anyone who comes to your site and connects with it via Analytics and contact forms, and don’t have to worry about a change that you didn’t authorize which might cripple your marketing strategy. Having your own site is a must! The one statistic that really jumped out at me was the Nielsen statistic, that one in two Americans will have a Smartphone by Christmas 2011. Maybe this statistic shouldn’t be that surprising to me, but, somehow, it is…and with that new technology comes a lot more people who are capable of surfing the web much more often. That’s why, like you mention, it’s so important for businesses to establish a web presence for potential customers. I like the points you make about why a web presence is so advantageous. People are, generally, much more willing to search for information online, rather than call you directly. An online presence also facilitates the process of information dispersal, that is, people sharing your information with others. So many people think they dont need a website to survive now and they are COMPLETELY wrong! Local or not! If you can get to the first page of google in your niche of business, you will see a ton of traffic and great results, period! This is the new age! Agreed. Building websites for business whether big or small will take you further and definitely get good results! I’ve been there, done that.. I say a website is a must for every business. I agree 100% with this article. In my experience with small businesses, most of them haven’t much idea of what a great web presence may be. For most, even having a web presence is a great start. However, providing great content, whether via a blog hub or their own site, is an amazing way to reach and influence consumers, building trust and growing a business. I too, live in a rural community where many business owners do not use email, let alone have a website. In a sense you are preaching to the choir here. How about a road map for selling these services to the Luddites in our community who most need them? In other words, if I go to business x in Greenville, Texas and try to convince them to do this, how do I explain the need to them in terms they will understand? Sample letters, a script for a phone call or visit, contracts, those things would be invaluable. Since you cannot be everywhere at once, sharing this information will not cut into your market share and will help strengthen your already formidable position as the go to person for local marketing. 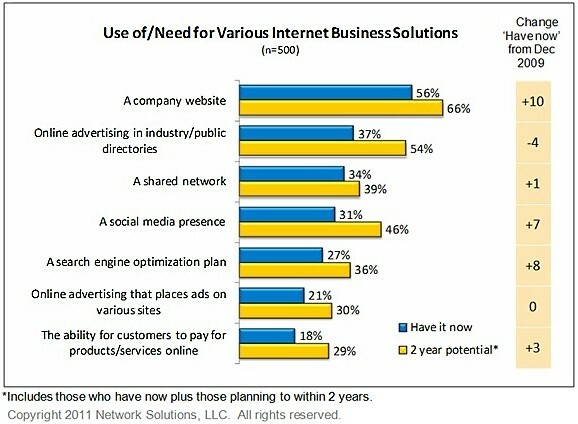 I wonder only 56% have company websites whereas the world progresses to such an extent??? Aren’t you astounded to see such a figure, Gail?? Though there is social networking connectivity, websites provides much detailed information & it clearly states that this is a concrete strong empire!!! Right??? Jordan would love you to read ..An Addiction Center — Truly the Place to Be! Along with my previous comment, I would also say it is not the huge task for a small business to become ranked and visible for “location oriented keywords”. A small amount of SEO, link building, and most importantly local directories such as Google Places, provide a great avenue to become first page results in your local area. It surprises me that the number of businesses with a website is only 56%, Gail. I can understand the social media accounts still being relatively low, but websites have been around for what seems like forever. Were you surprised by these numbers? Honestly, I am not surprised because when I talk to business owners and managers on the phone or in person many of them still have no idea why they would even want a Web presence. In small towns in rural Texas in one of their largest businesses only one person of everyone who works there even uses email! Many companies and stores think that if they are not doing mail order, then there is not much reason for a website. We of course know that they may be missing out. There have been so many times when traveling that I will first learn about a restaurant or smaller specialty stores from their online sites. These sites are sometimes just one page listing their address and a few details, but this is better than nothing at all. That is so astounding that so many people still don’t understand about a web presence. But still, it can get complicated: by the time you buy your URL, a blog, a host domain, and then try to learn to integrate it all, a lot of people (myself included in the past) have given up altogether. A profile, even on just one site like LinkedIn or Facebook could be really useful. Especially if you integrate it the way you suggest. I think having a website is crucial to any small business’ success. If you don’t do any SEO, having the domain is important because it makes customers think you’re serious, and that you’re not just some overnight shop. I agree, but it is now obvious to me that we have to explain this to business owners offline because some of the ones that most need a web presence are not even online ever anywhere. Others use email, but they have never looked at Twitter or Facebook or LinkedIn and probably do not know how to do research. It is even still common for Internet users to not know how to find things in a search engine. I know this sounds strange but it is absolutely true! The main reason a business MUST own their own domain is so they control where all the incoming links, business cards, printed materials, advertising, local search listings and everything else done to promote their business is directed. I totally agree with you but some businesses simply wouldn’t know what to do of a website. It’s a bigger investment that most people would imagine.